Here's your entry point to modern physics without advanced math. Only $24.99 for an infinite supply of physically accurate subatomic particle decay events and the tools with which to understand them. Watch this QuickTime screen-capture movie for a whirlwind tour of the software if you have a fast internet connection. Use the navigation menu to the left to find out more about OnScreen Particle Physics™ and to find other resources for teaching and learning about modern physics. Click here to purchase online. "I can't imagine teaching real 'modern' physics without it!" Physicist-designed OnScreen Particle Physics™ simulates a particle-detection chamber, the device used by researchers into the fundamental properties of matter at high-energy accelerator facilities such as Fermilab. OnScreen Particle Physics™ is primarily aimed at teachers looking for a way to introduce modern physics into their classrooms from a "how we know" perspective, but it is of interest to anyone that wants to know how particle research is done. By enabling students to carry out simulated experiments, OnScreen Particle Physics presents modern physics as a human activity, not just a set of facts. It is accessible to students at various levels, as no advanced mathematics is required. The heart of the OnScreen Particle Physics™ environment is the simulated particle chamber, which appears on the computer screen in three-dimensional perspective. At the user's choice, particle decay events, randomly generated in accordance with the true physics, appear in the chamber as charged-particle tracks, curved by the chamber's simulated magnetic field. Color is used to distinguish the tracks of different particles. The user can rotate the chamber to view the tracks from different perspectives and can replay the event, thus obtaining a vivid picture of the event in both space and time. The user controls the energy of the particle to be injected into the chamber, the size of the chamber, and the strength of the magnetic field. On-screen tools, including projection views and an electronic tape measure, allow the user to solve the puzzle of particle masses and lifetimes exactly as real particle physicists do. 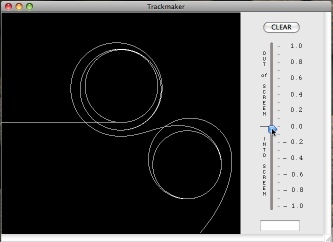 A bonus component called Trackmaker builds physical intuition in a gamelike, interactive simulation of the motion of a charged particle in a user-controlled magnetic field. Interesting events may be saved to disk for later analysis, and both chamber views and projections of events can be printed. The ability to save events allows teachers to test students' understanding of the physics by giving them events to analyze with the OnScreen Particle Physics™ tools. Windows version: Runs on any PC with Windows XP or greater. Macintosh version: Runs Mac OS 10.5 or greater. OnScreen Particle Physics™ comes with a User's Guide (download for inspection), which includes a brief introduction to the physics of high-energy research, and an Instructor's Guide (download for inspection) with detailed examples of particle mass and lifetime determinations. Every order includes these manuals in Adobe Acrobat format for on-screen viewing or easy printing. Mac users note that the Preview app inverts some of the images in the guides, while Adobe Reader displays them properly. The single-user price for OnScreen Particle Physics™ is $24.99, and a ten-computer site-license is only $89. Purchase online and download to get started now!